Perhaps this plants are not 100% pure Astrophytum asterias but they may have a certain degree of hybrid origin. Description: Astrophytum asterias cv. Ruri Kabuto Akabana is a selected strain which combines the smooth green stem of cv. 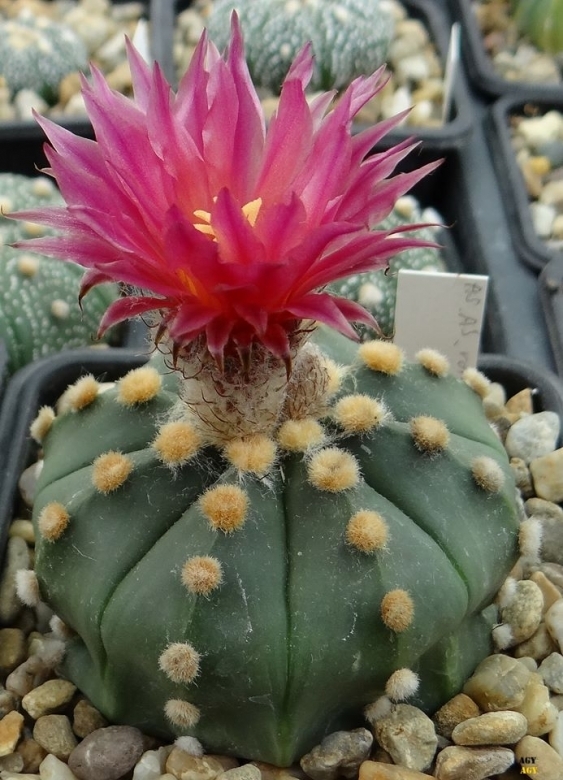 Ruri Kabuto (= Astrophytum asterias var. nudum) and the dark red flowers of cv. Akabana. Astrophytum asterias cv. Ruri Kabuto: This form has a very characteristic glabrous stem lacking the white tufts of loose hairy scales typical of the common Astrophytum asterias. The smooth green epidermis show up the felty areoles. The plants during cold and dry winter rest often take a nice red colouring. Astrophytum asterias cv. Akabana: This is an unusual variety, with red blooms, which is very uncharacteristic of this genus and a rarity in collections. This selected cultivars bears beautiful flowers shaded in dark pinkish-red, orange-red, purple or wine-red with usually even darker flower edges. However a very few red flowered specimens will appear time by time among normal yellow flowered plants, and are very rare. They are sought after collector and are sold (when available) for very high prices for that reason. Their traditional source, of course, is Japan but they are also found in European collections too. And also - like for the normal astrophytum - their flower colour tends to increase a darker tone ageing. Propagation: By seeds, remembering that seedlings dislike strong light and dry conditions and need to be repotted frequently. But plants are often grafted to accelerate growth as they would generally take at least a five years to reach maturity on their own.